Africa’s Travel Indaba is one of the largest tourism marketing events on the African calendar and widely regarded as the continent’s premier travel trade exhibition. Africa’s Travel Indaba has grown in status, quality and diversity to become one of the industry’s top three ‘must visit’ travel and tourism trade shows of its kind on the global calendar. 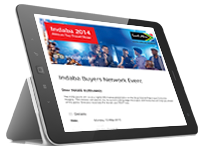 Why Brand at Africa’s Travel Indaba? Africa’s Travel Indaba showcases the widest variety of Southern Africa’s best tourism products and services and attracts national and international visitors and media across the world. Africa’s Travel Indaba is owned by South African Tourism and organised by Synergy Business Events (Pty) Ltd. For more information please visit our website. Africa’s Travel Indaba 2018 far exceeded its exhibitor’s numbers from 2017 with 1094 exhibitors in attendance. Africa’s Travel Indaba has developed a portfolio of unique branding, advertising and sponsorship opportunities available exclusively to exhibiting companies. The Branding, Advertising and Sponsorship guide details the various on-site marketing opportunities available to companies who wish to align their products/brands with the top branded event on the world tourism calendar. Whether your target is the exhibitor, the buyer or the media, use these opportunities to maximise your exposure at the exhibition.